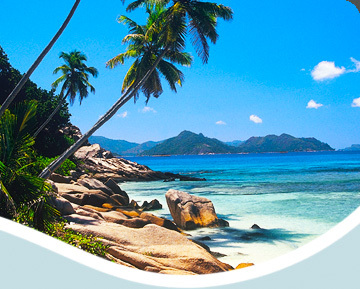 Escape to Paris for a romantic weekend break followed by an unforgettable private island experience in the Seychelles. Your safari experience: In Paris, enjoy a luxury amenity on check in including a bottle of French Champagne served chilled with a box of chocolates and a bouquet of fresh roses. A few steps away from the rue du Faubourg Saint Honoré, and Rue Royale renowned for their high-end designer boutiques, stands the Hôtel de Crillon, located close to legendary fashion houses such as Chanel, Dior, Lanvin, Hermès and Cartier..
North Island’s beaches are world-renowned – a privileged pleasure open to just 11 villas on the entire tropical island. All villas are sited directly on the beach and offer luxurious comfort in an ecologically-sensitive environment. North Island entices guests with sumptuous cuisine, a discreet tropical island spa and a fantastic choice of activities: included within your accommodation are two scuba dives per day (PADI certification required), hiking, canoeing, snorkeling, cycling, and island hopping to nearby Silhouette on guided dive trips. A laid back vacation, designed to pamper the body and excite the senses. On arrival in Paris, experience a personalized VIP welcome and private transfer assistance by the dedicated Guided Safaris team.